We've been seeing the Eastern Phoebe's around for a week or so and we thought it was time to get ready to fire up our nest camera. 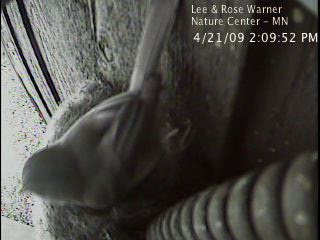 Each year, the Lee & Rose Warner Nature Center tries to get a web cam set up on a bird nest as part of a partnership project with the Cornell Laboratory of Ornithology. 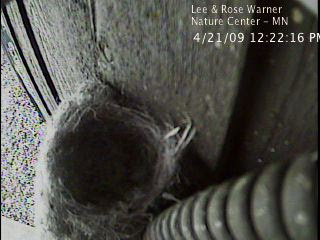 We've been successful the past two years getting the camera set up on an Eastern Phoebe nest. The same nest has been used for a number of years so we haven't had to do much in the way of moving cameras. After fixing a minor technical communications glitch with the Cornell server we are now sending a still image of the nest every 20 seconds. Here's an example I pulled off the server at lunch. As you can see, the nest is empty. This is the same nest site that has been used a few years running so we're hoping the birds will simply re-use it. A pair of phoebes has been seen checking out the nest and hanging out in the area so our fingers are crossed. Around 2:00 today I saw a bird fly up toward the nest while I stood by the window talking to someone. I ran to the office and grabbed this image off the server. I'd say we have a very good chance of them using this nest. In years past, people have been a little confused about the location and what exactly they are looking at in the image. The camera is pretty much directly above the nest and the pipe heading down to the nest in the lower right portion of the image is a disused electrical conduit that leads to an old junction box where an outdoor light used to be. We haven't used the light fixture in many years but it is a perfect platform for a phoebe nest. Here's what the set-up looks like from the side. The camera is an infrared equipped unit with a ring of IR LEDs around the lens so you can see in the nest even at night. Here's the wide shot of the location. The nest is under the overhang of the roof and is quite sheltered from the elements. In the overhead shots it looks like it is really high above the ground but is is only about 8 feet high. If and when the phoebes start to nest we'll be sure to post updates and let you know where they are featured on the Cornell site. Keep your tail-feathers crossed.